I finished the 24th Annual Great Chesapeake Bay 4.4 mile swim and lived to tell about it! Great photos and video footage of the race! Just before the two-mile marker, the twinge in my left shoulder showed up and strengthened with each stroke until it felt like sheets of sandpaper grinding on the nerves of my joint. But what was I going to do? Stop in the middle of the bay? Yeah, there were kayakers and safety boats at every breath, but it seemed like a greater effort to stop than to keep going. So I kept going. 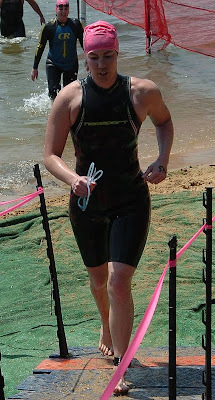 I had completed five open-water swims in my lifetime before traversing the Chesapeake Bay, two of which were 5K ocean swims in my teens – one in Ocean City, MD in high school, one in Kona, HI in college – and the other three within the past year in calm Pennsylvanian lakes. Two of those lake swims were 800 meters of triathlons, the other a 5K swim. Although the waves weren’t as treacherous in the Chesapeake as they were in the Atlantic, the Bay did have a few waves. More importantly, it had a current that pushed us sideways. 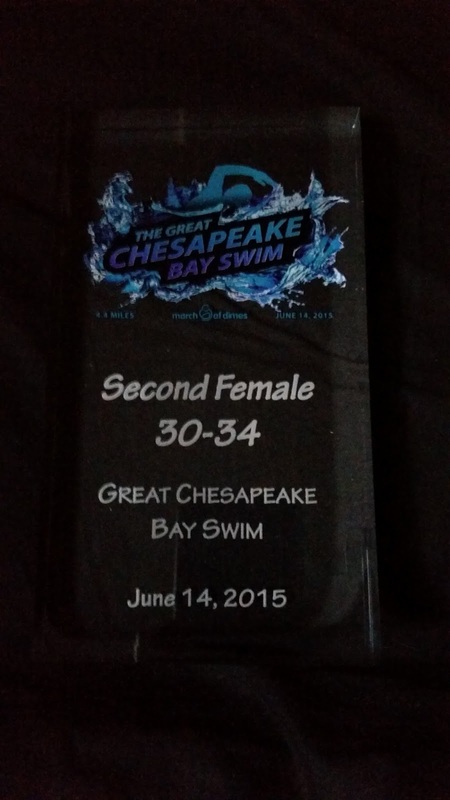 The course of the Chesapeake Bay Swim was mostly between two bridges. If we went under either bridge, we’d be disqualified. A few times when I breathed to my right, I could see the bridge, looming too closely overhead. Had I not been a strong, confident swimmer, I might have panicked. Instead, I angled myself to the center of the bridges, sideswiping (accidentally, oops, sorry) a few other swimmers on the way. The more I tried not to think about my shoulder, the more I felt it. I kept trying to adjust my stroke to avoid the twinge, but nothing gave me a reprieve. When my goggles filled with water and the salt stung my eyes too badly to ignore it anymore, I stopped. I drained the water and then took a few breaststrokes to re-sight the course. It gave my shoulder a break. Maybe I should swim more breaststroke? No, not if I wanted to meet my goal of finishing under two hours. So I kept swimming. Two large, round buoys, like enlarged beach balls, indicated when it was OK to cross under the east bridge and head to shore. Nearly done, except this was probably the most grueling stretch. You’re tricked into thinking you’re almost done, and you are, but there’s still a half mile to go. You’re swimming straight for shore, but it doesn’t seem to be getting any closer. I’ve had nightmares like that, haven’t you? The water got shallow, and some swimmers stopped to walk or do dolphin dives. I just kept swimming. When I took a stroke and caught more dirt than water, it was time to stand and run across the finish line up the a small hill a few yards away. The finish was like running a gauntlet of enthusiastic volunteers. One took my timing chip. One took the paper number I had to put inside of my swim cap. One congratulated me for finishing. Another unzipped my wetsuit. And then they passed me on to the gauntlet of swimming spectators behind the pink tape. Then I filtered through the gauntlet of food. I grabbed a bottle of Gatorade – which I never drink – and finished it in two gulps. Grabbed a bottle of water and sucked on that, too. A banquet table of carbohydrates was next. Cookies. Donuts. Subs. “I’d like something with meat in it, please.” And then I downed a half of a cold-cut sub while still dripping wet with Bay dirt caked on my face and my cap and goggles shoved down the front of my suit for safe keeping. My mom had waited at the finish line for me for hours. She followed me through the gauntlets on the opposite side of the pink tape, calling my name, taking my photo, smiling so hard I couldn’t tell if she was laughing or crying. At the end of the gauntlets were firetrucks with hoses to rinse off the Bay grime. I found my bag in a sea of numbered trash bags and changed into the top half of my clothes while standing under some trees and the bottom half in a porta-potty. My mom bought me two jumbo hot dogs, a chicken sandwich for herself, and we sat under a tree away from the crowd and ate. I finally caught my breath. I’m disappointed that my shoulder didn’t cooperate, and I wonder how much faster I could have swum had I done more to prepare my shoulder for swimming that distance. But finishing that race is enough of an accomplishment, and now I know what I'll need to do to improve for next time.